Angela Duckworth, a researcher from the University of Pennsylvania, studied West Point cadets and found that it wasn’t those with the highest SAT scores, leadership potential scores, or physical aptitudes who performed the best. It was cadets with a strong passion to do well, a willingness to work hard, and persevere against obstacles. Her research panned out in other environments as well. In short, it’s the mentally tough who succeed. What does it mean to be mentally tough? It’s not necessarily being able to withstand climbs up mountains in snowstorms or other torturous feats. The key ingredients are woefully anticlimactic— consistency and habits. Many of us could get up early one morning and run a few miles or go for a nice long walk. Fewer of us could do it three times a week, and even fewer, every day. Each level of frequency is another distinguisher of the mentally tough, folks who focus on daily actions (walking at 6 a.m. today, eating a salad for lunch every weekday for 3 months) rather than the dreamy idea of a far-off outcome (losing 30 pounds). By focusing on what’s before them next (today’s walk, today’s salad), the mentally tough are able to continue to take daily steps toward larger goals even when motivation is low. They commit to actions and schedules, rather than lofty ideas or fame and glory. This doesn’t mean they aren’t inspired by success, only that they prioritize habits, and put their faith into the idea that steps make the staircase, even on days when the top of the staircase is up in the clouds. And they hold on to their structure with unshakable tenacity. The mentally tough figure out how to fit the daily steps in – even if they’re stepping at 4:00 a.m. – and then they acknowledge their hard work as an achievement in and of itself, something they want to continue building on. And although there’s more research to be done, it’d be interesting to know if the mentally tough feel better after they achieve their goal, better than say, someone who lucks into quality performance because of good genetics or arbitrary circumstances. 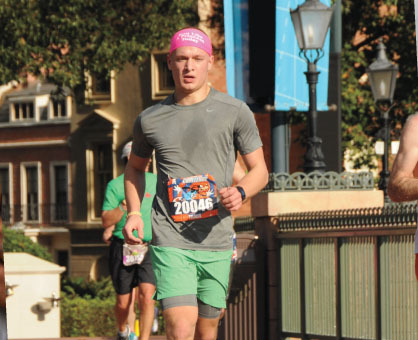 “Finishing a marathon,” says Bladecki, “gives me so much satisfaction. I feel overwhelmed and rewarded. I break down a little, then I find my family and friends and hug it out. Then I get a beer.” Which might mean, that the mentally tough don’t belittle what they’ve done. They come by it honestly, and they celebrate with the genuine gratitude of a truly hard worker.